The Food and Drug Administration (FDA) is studying why some medical facilities are failing to properly sterilize medical devices for reuse in surgeries and endoscopy procedures. The result is patients are being exposed to microscopic amounts of blood, body fluids and tissues from other patients, according to a recent FDA Consumer Update. This exposure may have resulted because the devices were not properly reprocessed, cleaned, disinfected or sterilized. Patients are being exposed through surgical instruments such as clamps, forceps and endoscopes. Endoscopy procedures are often performed to diagnose cancer and other illness. The FDA states that transmission of infection was extremely rare in reports it has received about patient exposure. It states the risk for acquiring an infection from a reused medical device is low. The FDA states patients can protect themselves by learning about their medical procedure and asking their medical facility what steps it takes to reprocess surgical instruments. The agency suggests patients also research their procedures on the websites of professional organizations, such as the American Academy of Family Physicians. Making sure manufacturers are providing clear cleaning instructions. Making sure hospitals and staff understand and follow the instructions. Improving medical device design to facilitate cleaning and sterilization. Consumers are advised to stop using a second type of CooperVision’s Avaira contact lenses due to a defect that may result in blurry vision and other eye injuries. On Nov. 16, an unknown quantity of CooperVision Avaira (enfilcon A) Sphere contact lenses were recalled due to the unintended presence of a silicone oil residue. CooperVision, a Fairport, NY-company, recalled the lenses in cooperation with the Food and Drug Administration (FDA), which states that the silicone oil residue can result in a wide range of symptoms, including eye discomfort, hazy and blurry vision and eye injuries requiring medical treatment. 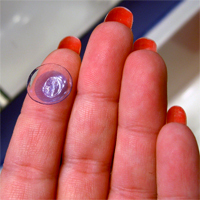 The FDA regulates contact lenses as a medical device. The recalled lenses were manufactured from Feb. 1, 2011 to Aug. 24, 2011 and distributed from March 2, 2011 to Nov. 15, 2011. The contact lenses were used to correct myopia and hyperopia and non-aphakic individuals with non-diseased eyes. The lenses may be worn by individuals who have astigmatism of 2.00 diopters or less that do not interfere with visual acuity. Lens wearers have been instructed to stop using the lenses immediately and contact their eye care professional. They can visit the CooperVision recall website and enter the defective medical device package numbers to determine if their lenses have been recalled. The medical device recall expanded another in August 2011 for limited lots of Avaira Toric contact lenses. CooperVision said the product defect on that line has been corrected through its quality system process. Contact lens injuries are prevalent, due to product defect or improper use. They are most common among children and adolescents. In a study published in the July 2010 Pediatrics, FDA researchers reported 23 percent of total medical device injuries in 2004 and 2005 in the U.S. involved children and contact lenses. Children ages 11 and over were the most affected. Common personal injuries include corneal contusions and abrasions, hemorrhage and conjunctivitis. Click to read the FDA notice about the CooperVision recall. Radiation technology is on the rise, delivering both higher and more precise doses of radiation treatment and better detecting diseases, including cancer. However, as technology improves, patient safeguards and hospital systems are lagging behind, resulting in medical errors that go unnoticed. While there are no recent reports of error, given the large number of cancer treatments as specialized centers, patients in Massachusetts are certainly at risk for excess radiation exposure. At a New Jersey hospital, 36 cancer patients were overradiated by a medical team that was inexperienced in operating new radiation technology. The mistakes continued for months because the hospital did not have a system for catching the errors. A man in Louisiana received 38 doses of overradiation because the machine used to treat him was so new that the hospital made a miscalculation, even with training instructors still on the grounds. Although radiation mistakes resulting in personal injuries are rare and accident reports show that some mistakes could have been detected through standard protocol checking, some oncologists are warning that safety procedures need updating. Adding to the safety concerns, hospitals may not have sufficient funding to operate the cutting edge technology correctly and manufacturers sometimes sell machines before computer errors have been resolved. Mistakes in the application of radiation technology also raise questions about the training and supervision of medical physicists and radiation therapists. Licensing and registration requirements vary greatly from state to state, and 16 states do not require licensing or registration at all. The radiation technology regulation regime creates the potential for injuries as well. Laws protecting radiation patients are patchwork and poorly enforced, meaning hospitals that cause injury and fail to report mistakes go unpunished. Additionally, the marketplace for radiation technology is largely unregulated. New products receive only a cursory review by government regulators. In a market where new technology is the key to attracting business, both manufacturers and hospitals are eager for new products quickly, even if that means technology with existing errors and operational uncertainties. Over radiation can cause skin reactions, like rashes, fatigue, diarrhea, nausea and vomiting, trouble swallowing, weakness, headache, and hair loss. Radiation can also increase the chance of getting certain cancers. For more information on radiation technology and its risks, see the New York Times article The Radiation Boom. For more information on the risks and side effects of radiation treatment, see the Mayo Clinic website.